A balance of trees that exploit the finest rootstocks, catches sunlight, and is most accessible to our pickers. Apple trees which are easier to prune and maintain, and have characteristics that enable better quality. A variety of soils that enable good root development and facilitate our drip irrigation of nutrients. Growers educated in modern horticultural practices with state agricultural support. Integrated pest management (IPM) including pheremone disruption to minimize destructive insects. 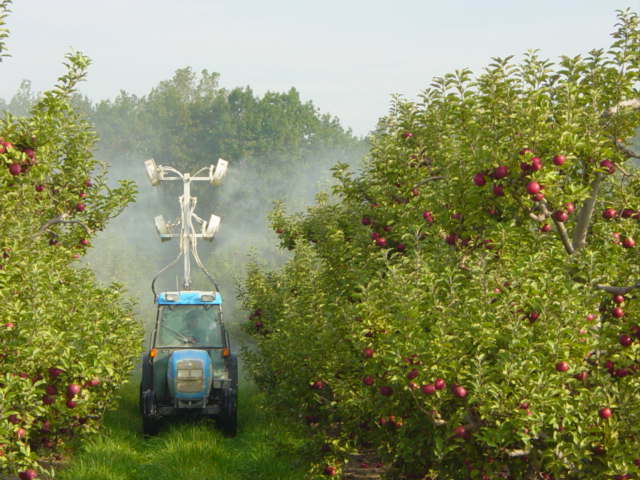 Applewood Orchards is a donor sponsor towards the state's "pest net" services which helps predict spray cycle needs. Isolated soft chemical storage for a strict responsibility to a safe environment and product. Modern farm equipment, including new sprayers, for all necessary orchard management. Associated growers with equally high standards for whom we pack. 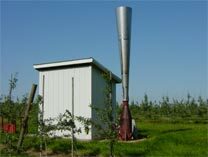 Applewood Orchards owns and uses a cutting edge application of "hail cannons" to minimize damage from thunderstorms. We are equipped with deterrents to destructive cold weather from bloom to harvest time with wind machines, smudge pots, and helicopters. The River Raisin is next to much of our orchards and provides a natural benefit of 2 to 4 degree warmer temperatures at critical times. Use of chelated topical clay on foliage and fruit to minimize sunburn at periods of extreme heat. Harvest start dates that are days and weeks ahead of some other Michigan growing latitudes enabling our customers to have the first available Michigan apples of the season. 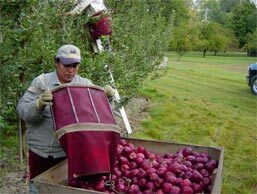 Access to seasonal pickers with season to season consistency. Company owned labor housing with a wholesome environment for our workers and their families. Minimal needs for our pickers to utilize ladders given our accessible style of apple trees. Sixteen of the most modern and efficient controlled atmosphere (CA) rooms east of the Mississippi river with a capacity to store 260,000 bushels. Applewood Orchards CA rooms are tight and efficient and maintain high humidity very well. MCP, trade name "Smart Fresh", technology to provide the finest and hardest apple from storage at time of packing. Scientific selection processes for best lots to store based upon pressure , sugar, and starches by variety. Orchard bins in both traditional wood and testing new Macro plastic bins. Consistent pest/rodent prevention is employed.